The end of the school year is usually a time of concluding lessons, wrapping up projects, packing up classrooms, and looking forward to a bit of recovery time (however brief it might be). Most of all, it brings a huge sigh of relief – the school year has been conquered! But for many teachers this year, the end of the year marks a step into uncertainty and unpredictability because they have been laid off or in some other way lost their position. The pressure is high in many states that are struggling to meet revenue needs. Some cities, like Chicago, New York and Philadelphia, are closing dozens of schools. In Michigan, an entire school district was laid off and school canceled two weeks before the end of the school year. With federal sequestration, the uncertainty is extended, with most states only now discovering the toll it will take on their education budgets for the coming year. The newly laid off join those educators already experiencing long-term unemployment and underemployment, and new teachers just out of their training programs – all looking to fill the decreasing numbers of teaching positions available. In addition, many teachers are becoming more and more fed up with the conditions under which they have been obligated to work, and they are also looking for new situations. It is important for all teachers who find themselves tossed into the waves of unemployment to know that they are not alone, and that many education professionals have found successful ways to cope. When I lost my position in 2011, I was not necessarily surprised (the financial writing had been on the wall in my district), but I was not professionally or emotionally prepared. I had been teaching almost 7 years, and like many teachers, I thought I was safe. I wasn’t, and though early cuts often take newer teachers, many schools by now are cutting deep into their reserves of veteran teachers. Since becoming unemployed, I have gone through a tremendous learning curve to raise my professional acumen, make myself more marketable, and to find ways to cope with the loss of a position I so passionately loved and to find new ways to use my skills. Thousands more teachers now face this process as this school year ends. I have written many times about the uncertainty of unemployment, and in a career field like education, it can be even more of a discouraging prospect. Our field does not prepare us to be educational professionals in capacities outside our familiar classrooms unless we make an independent effort to do so (and even then, there is rarely guidance on how to do this). A symptom of a system dependent on a seniority process that has ignored developing relevant, innovative ways to evaluate teacher quality is that many highly skilled teachers lose their positions when budgets shrink. Meanwhile, how to deal with the work of unemployment (yes, it’s work to be unemployed! ), how to effectively job search, and how to manage the emotional toll of losing the security of a teaching position are not pieces of information readily available in most districts. Because of this lack of support and communication about being a teacher without a classroom, I wrote a book that will be published by The Educator’s Room on June 1. 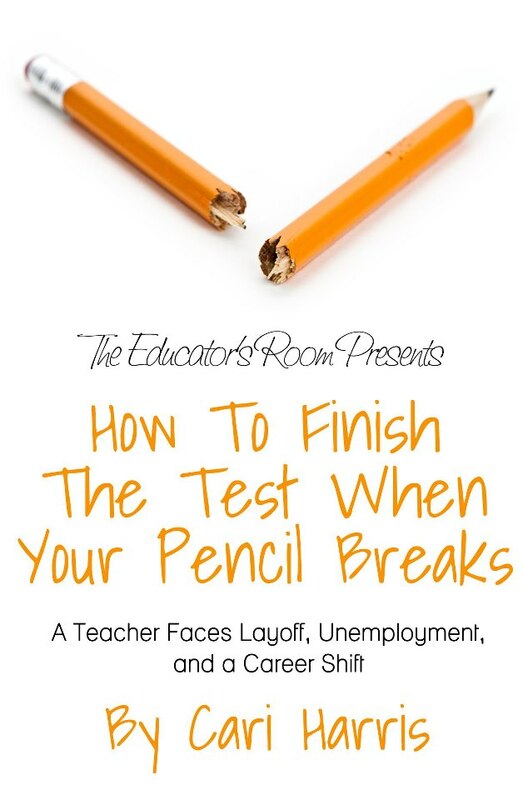 The book is called How to Finish the Test When Your Pencil Breaks: A Teacher Faces Layoff, Unemployment and a Career Shift. It is a combination of some of the columns I wrote as I journeyed through my experience of unemployment at the beginning of the second school year in which I found myself without solid work. In addition, it includes some of my ideas about how the education profession could institute new and innovative ways to create a more professional, quality-based system upon which teachers could rely for advancement and challenge. The book contains practical tips on how to deal with getting the news about being laid off, how to deal with unemployment, and ways to begin to think “outside the classroom,” or how to use your already well-practiced expertise in new ways. It would be nice if schools and districts cared for the professionals they lay off every year by providing them ample resources and by preparing them as professionals before the layoffs even happen. But in most districts, that is simply not the case. Hopefully, my book will provide encouragement to those who are experiencing my same situation of long-term unemployment and underemployment, and those to whom the experience is a fresh one. I hope also that it will provoke still employed educators to think through their own professionalism and what they truly want out of their education career, especially if it takes a turn they weren’t expecting. This is no longer a secure career field, and it is time that the experts within it begin to acknowledge that. Yes, I still hope to return to a classroom, and yes, I’m still making every effort to do so. But in the meantime, I hope that if you are working for those same things, you will know you are not alone. All of us educators, whether we have a classroom or not, can be part of a positive change in a system that all too often seems to leave us behind. To buy the book click here and enjoy $3.00 off using this code ER4CQKT6. I am partnered with former teachers due to the system could not afford to have them around anymore. Contact me on how they went from unemployed to be unemployable and now living life unlimited.